God’s example is of a ‘lavish love’ that does not hold back but expresses itself wonderfully. The woman had clearly been deeply touched by this love and was responding in the most expressive way that she could. This was not the love of obedience but the overflowing love from a grateful heart. It clearly touched Jesus deeply. So significant did He find it that He promised, and ensured, that it would continue to be told wherever the gospel was preached. But there was something more. Although the woman would have been unaware of it Jesus saw in her actions an anointing of Him in preparation for His burial that lay just ahead. He had been blessed by love just before He was deserted, rejected and abused. And such was the power of the perfume that it was probably still noticeable when He was nailed to the cross. 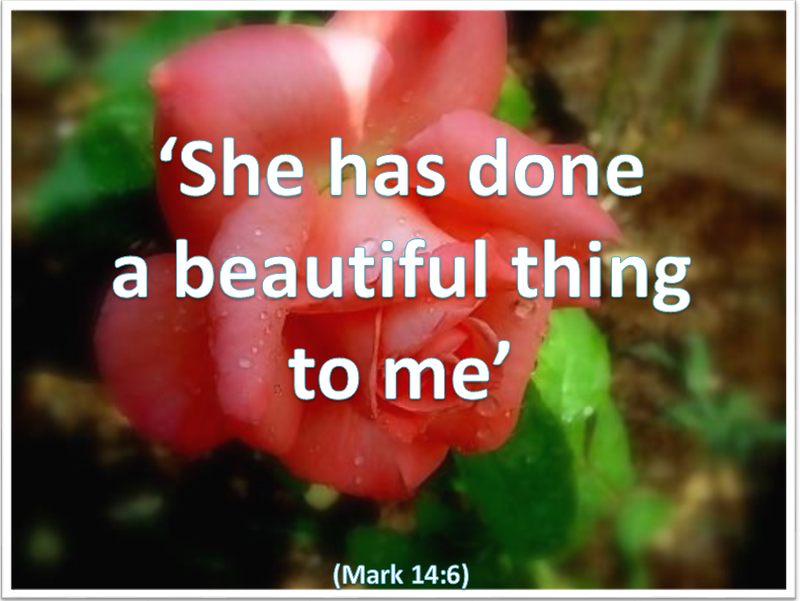 Could you do a beautiful thing for the Lord today – or for someone He cares about?. Lord Jesus, forgive me for always wanting something from You. Touch my heart with Your love so that I too may wish to love You back unreservedly. Amen.